Safety began with protecting worker health. While that remains the core mandate, safety today grows ever more sophisticated. With the addition of safety-enabled drives and PLCs, safety systems implement functional safety to deliver much higher levels of operational equipment effectiveness (OEE). Examples of time-saving functions include Safe Limited Speed, Safe Direction, and Safe Torque Off. Before the machine can determine whether or not to invoke one of these functions, it needs to gather and process sensory input. Motion Solutions carries an array of sensors that deliver safety, reliability, and ease of implementation. It’s important to note that all of these components need to feature built-in redundancy in order to eliminate common-cause failure. Light curtains are optoelectronic sensors designed to detect when a person or object is entering a designated space. 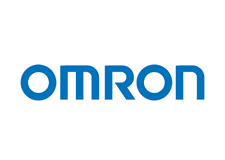 An optoelectronic source, typically an LED, projects one or more parallel beams across the region of interest toward a receiver unit consisting of multiple photodetectors. When someone or something breaks the beam, the sensor registers a voltage dip, sending a signal to the controller, which takes action. Light curtains are passive, versus active, sensors. We offer a variety of light curtains ranging from compact, space-limited models to full-sized, powerful versions. Our sensors can be safety rated, which means they feature redundant designs intended to prevent common-cause failures. These systems can be sized and built to customer specification. In addition to an extensive array of light curtains, users can choose from multiple options in terms of controls and operation. Laser scanners are active sensors that depend on the ability to scan in order to function. They are able to map their surroundings and correlate that with information in 3-D space. These scanners enable safety measures to be applied very precisely. Robot safety, for example, used to be binary: if personnel were in proximity to the robot, it was shut down. If they left, it was allowed to operate again. With scanners, the area around a robot can be divided into zones. A buffer zones can be defined. If personnel are more than two zones away, for example, the robot might operate normally. If they begin walking into the buffer zone, the robot can be programmed to slow down. Once an individual crosses a specific threshold, the robot might only be allowed to operate on the side away from that person. This protects against injury while minimizing impact to productivity. 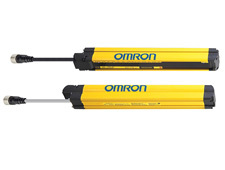 Scanners also can be programmed to ignore certain obstacles in the field of view, such as structural columns. They are used extensively in automated guided vehicles in order to enable those units to operate safely and effectively around personnel. Safety switches are equipped with built-in redundancy that ensures function. A button will have two sets of contacts rather than one, for example. 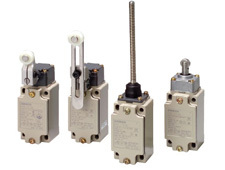 Safety switches are available in a variety of colors, sizes, and form factors. We offer a robotics-approved enabling switch. An enabling or live-man’s switch is a fail-safe method for operator safety. Options include a user-mountable switch as well as a handheld solution. 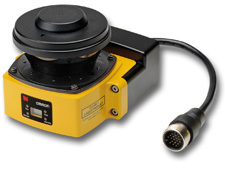 The handheld solution offers many variations, including a holding key (sold separately), an integrated e-stop, and an integrated momentary button. 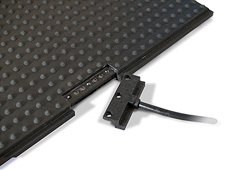 Safety mats are a simple, yet rugged solution to safeguarding operators from potential hazards. They can be used to determine whether an operator is in a safe zone. They can be tied machine operation, for example by placing the mat in front of the HMI and preventing the machine from running unless the mat transmits a signal showing that the operator is standing on it. Safety mats are highly customizable, highly visible and easier to use than other traditional guards. While interlocks and barriers require operator action or inaction, safety mats require no input from the operator to guarantee their safety.